A lot of exercise goes into hunting. You often spend a lot of time walking around in the woods. This is especially the case when hunting birds. If you shoot a bird, especially in a marshy area, it may be difficult to locate the felled bird to retrieve it. That’s where bird hunting dogs come in. Bird hunting dogs are trained to help hunters retrieve birds that have been shot. If you think this could help you on your next trip to the woods, then you should definitely get one. Make sure that the dog you get is trained. Breeds of dog which hunt birds have special skills that set them apart from regular dogs. They are incredibly obedient and very smart. Although most dogs can fetch if you throw things, they often get confused if they can’t see where it landed. Dogs that are trained to hunt birds are skilled in finding birds that have fallen out of site. They use their tremendous sense of smell as well as their improved eyesight to find the felled bird. Some dogs, ones that aren’t well trained, will have a hard time giving up a killed animal once they have it in their teeth. They want the bird for themselves. This is a very bad trait for dogs. Your hunting dog should have good sense of will to have the dead bird in its mouth and be able to hand it off to you easily. After all, you aren’t planning on playing a game of tug of war with the dog, so this shouldn’t occur. Hunting dogs aren’t always on duty. Most of these dogs are then kept as regular pets in the homes of their owner. If this is the case for you and you have small children, make sure that the dog has a good temperament. Some dogs are so focused on their job that they tend not to be very friendly. Try to avoid these kinds of dogs if you have a family with small children. Instead, look for a dog that is nice to kids and doesn’t bite or growl at them. 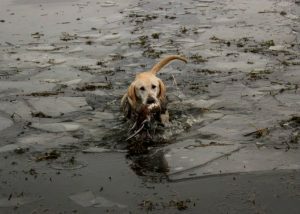 When you look for a bird hunting dog for sale, keep these main points in mind. Hunting dogs should be able to find hidden objects, be obedient to their owner, and be safe around children. Try to find one with all these attributes. Although they may be a bit expensive, the buy of the dog will be well worth it in the end.